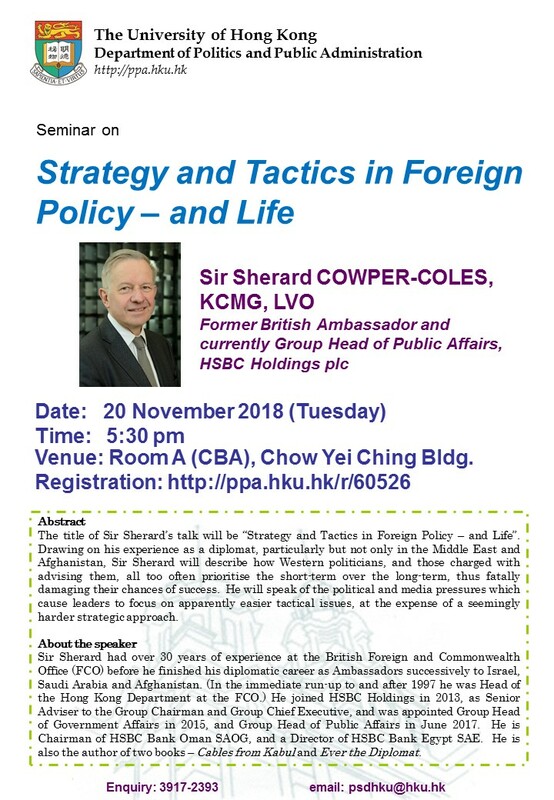 The title of Sir Sherard’s talk will be “Strategy and Tactics in Foreign Policy – and Life”. Drawing on his experience as a diplomat, particularly but not only in the Middle East and Afghanistan, Sir Sherard will describe how Western politicians, and those charged with advising them, all too often prioritise the short-term over the long-term, thus fatally damaging their chances of success. He will speak of the political and media pressures which cause leaders to focus on apparently easier tactical issues, at the expense of a seemingly harder strategic approach. Sir Sherard had over 30 years of experience at the British Foreign and Commonwealth Office (FCO) before he finished his diplomatic career as Ambassadors successively to Israel, Saudi Arabia and Afghanistan. (In the immediate run-up to and after 1997 he was Head of the Hong Kong Department at the FCO.) He joined HSBC Holdings in 2013, as Senior Adviser to the Group Chairman and Group Chief Executive, and was appointed Group Head of Government Affairs in 2015, and Group Head of Public Affairs in June 2017. He is Chairman of HSBC Bank Oman SAOG, and a Director of HSBC Bank Egypt SAE. He is also the author of two books – Cables from Kabul and Ever the Diplomat. Venue: CBA, Chow Yei Ching Bldg.